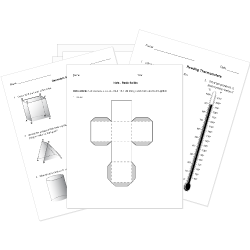 You can create printable tests and worksheets from these Angles questions! Select one or more questions using the checkboxes above each question. Then click the add selected questions to a test button before moving to another page. Two angles whose measures sum to 180°? Based on the following information, where [math] ang ABD[/math] is a right angle, which equation could be used to solve for x? 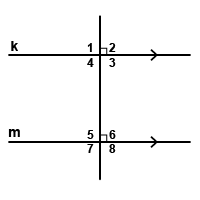 Using the diagram shown, [math]ang[/math]1 and [math]ang[/math]4 are supplementary angles. If [math]ang[/math]4 = 70[math]deg[/math], What is the measure of [math]ang[/math]1? Two angles are angles if the sum of their measures equals 90 degrees. If the measure of angle 1 is 55 degrees then the measure of angle 3 is degrees. In the diagram, [math]ang[/math]DBA is a 90[math]deg[/math] angle. What type of angles are [math]ang[/math]ABC and [math]ang[/math]CBD? The measure of [math]ang 1 [/math] is [math]150deg[/math]. What are the measures of [math]ang4, ang3, and ang2[/math]? Two angles whose measures have a sum of 90 degrees are called what? What is the number of degrees in the third angle of the triangle? 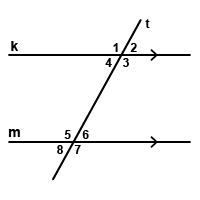 What geometric term names the top and bottom angles in the figure shown? Two angles are complementary. One angle measures 35 degrees. What is the measure of its complement? Two angles are supplementary. Angle A is twice as large as angle B. What is the measure of each angle? Given the following, including the fact that [math]ang ABC[/math] and [math]ang CBD[/math] are supplementary, what is the value of [math]mangABC[/math]? An angle that has a measure greater than 90 degrees and less than 180 degrees is called a(n) angle. What type of angle is greater than a right angle? Pick two.